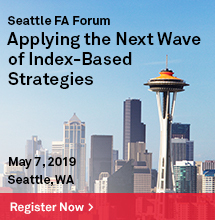 The goal of low volatility strategies is to provide investors with protection in falling markets and participation in rising markets. 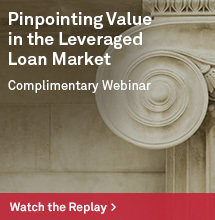 The need for protection has become more relevant as a result of recent market declines in the U.S. and prolonged weakness overseas. 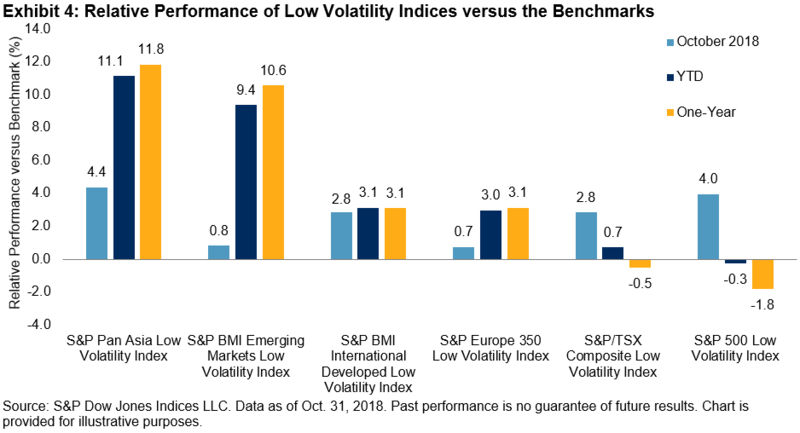 Through September, low volatility in the U.S. was the ugly duckling of factor strategies, underperforming the S&P 500® and lagging far behind the then-ascendant growth and momentum strategies. However, the tide turned in October, which was a rough month (to say the least) for U.S. equities. 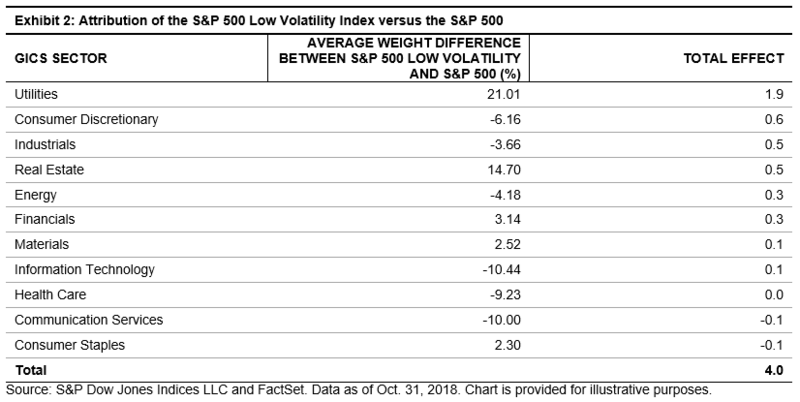 As seen in Exhibit 1, the S&P 500 lost 7%, while the S&P 500 Low Volatility Index outperformed by 4%, providing a much needed protective cushion. 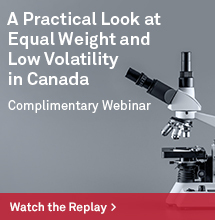 Exhibit 2 shows that the most important component of low volatility’s success was the strong relative performance of Utilities, where low volatility has a substantial overweight. 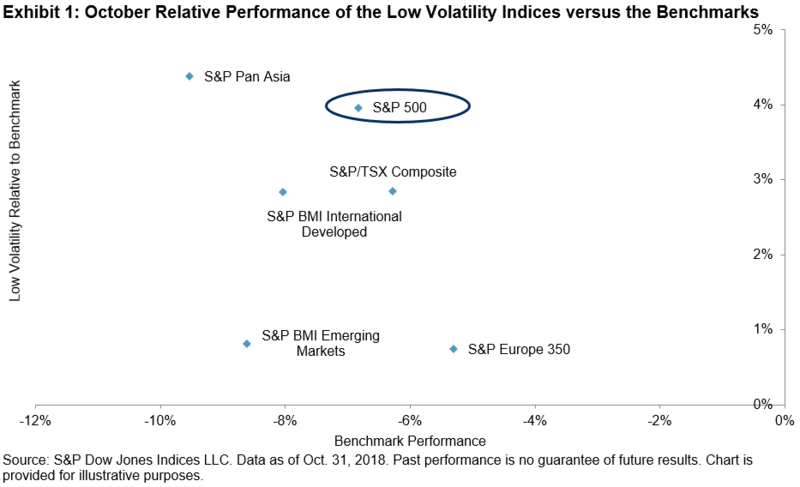 Low volatility’s success was not unique to the U.S. Exhibits 3 and 4 show that similar trends occurred globally, particularly in the emerging markets and Asia, regions that have experienced turmoil for most of this year. 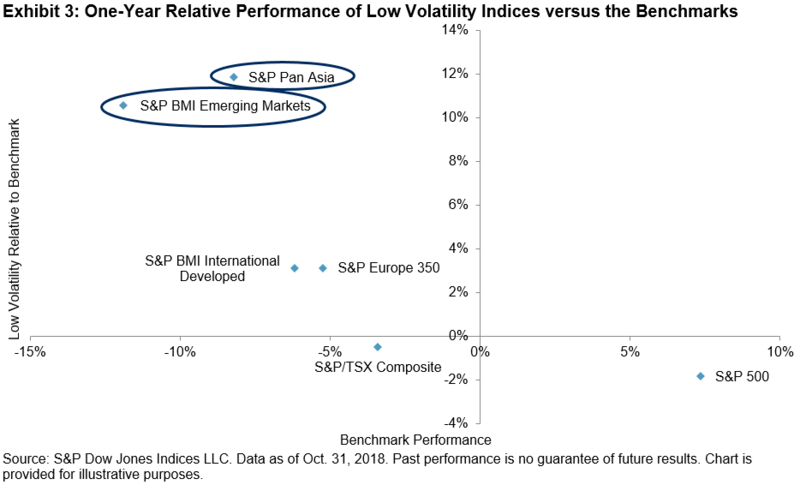 The S&P Pan Asia Low Volatility Index and S&P BMI Emerging Markets Low Volatility Index outperformed their benchmarks by 12% and 11%, respectively, for the one-year period ending October 2018. 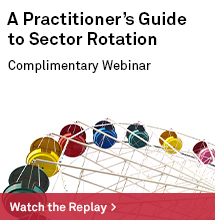 Low volatility strategies have been successful across regions and time horizons in providing protection during market declines.